We were back! After an absence of two and a half years we finally managed to coax our teenagers out of their bedrooms (I am sorry to say that they didn’t really emerge from their cocoons as the beautiful butterflies my wife had promised – I think they need to hibernate for a couple more years before that happens). Given the gravitas of the occasion, various members of my family turned out in support. And was the sun beaming to match our moods? Erm…well…no, not really. It was a little on the damp side. And a little on the muddy side too. This wasn’t the true Coastal Path. 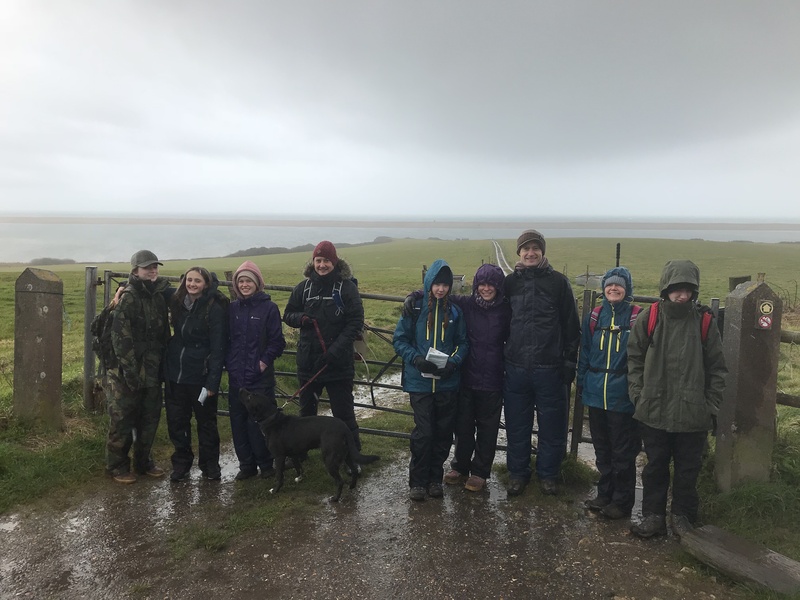 We were still walking alongside Chesil Beach, having opted to take the inland route through fields rather than walk along Chesil Beach itself. This is because parts of Chesil Beach are inaccessible at various times of the year due to firing ranges, nesting birds, etc. As we could not guarantee when we would come back to continue our walk we saw the best option as following the official South West Coast Path. Still, despite the rain and the mud nothing could dampen our high spirits. Indeed, when I put my first full foot into a an unexpectedly deep and muddy puddle, and when the water spilled over the rim of my boots and soaked my socks, all I could do was smile at the sheer pleasure of being back on out Coastal Path – oh, how I had missed boots full of water (it really doesn’t take much to keep me happy). 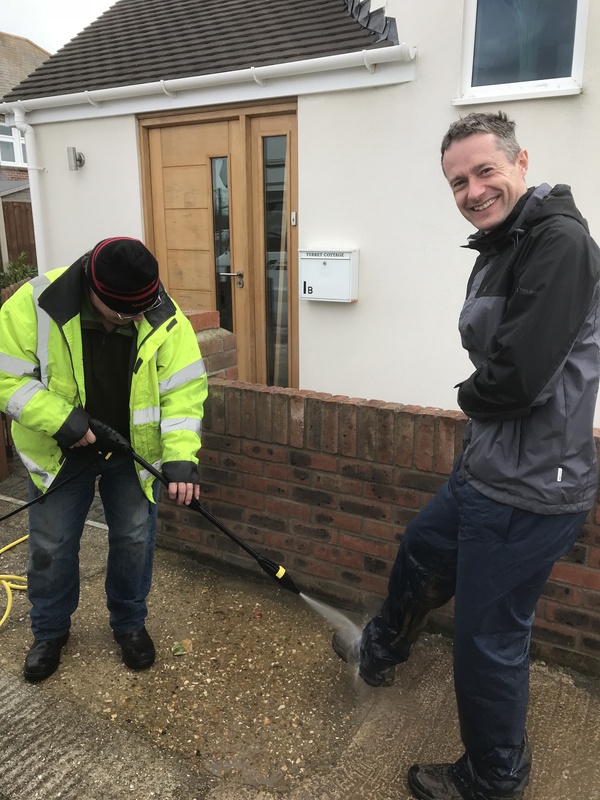 Even better, as we got back to the cars there was a man with a pressure hose cleaning his caravan – this very kind gent agreed to give B of the ABC’s a free hose down! 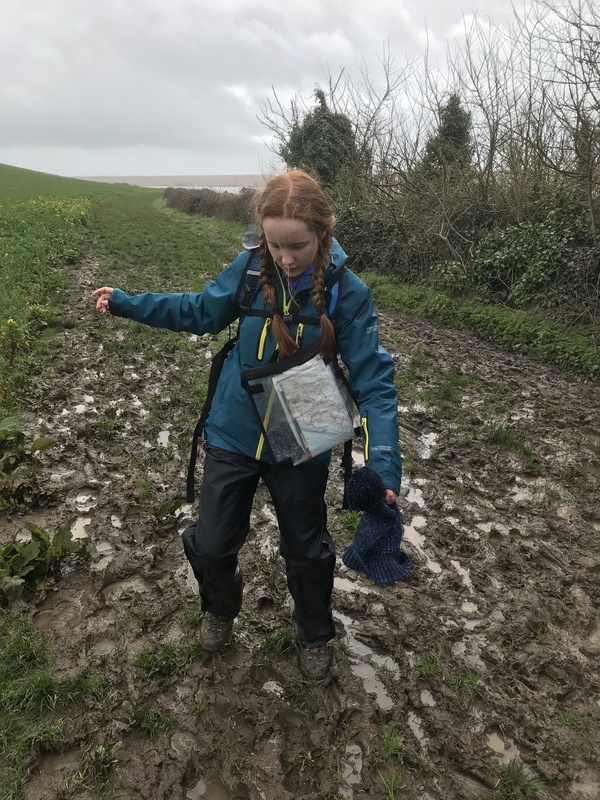 This entry was posted in Dorset and tagged coast, Dorset, mud, travel, walking. Bookmark the permalink. And good call for not trying to walk Chesil Beach. Even had it been accessible all the way, that’s a lot of shingle! Yay! So happy to see you guys back! Thanks Jill – it’s good to be back! Glad to see that you have got the whole family ‘back on track’ Nic … albeit a pretty muddy track. I think that I might have been tempted by the shingle of Chesil Beach ! Thanks RH – two and a half years of hard effort finally paid off! Nice to see you back. I did feel for you with the terrible wet weather over Easter. That stretch of path can be quite muddy even after dry weather, so I can imagine how bad it was after and during all that rain.